Meet Piia. 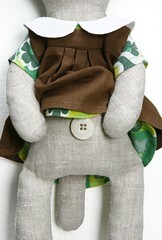 She's one of the three special rag pets going to Seattle for the Plush you exhibition. 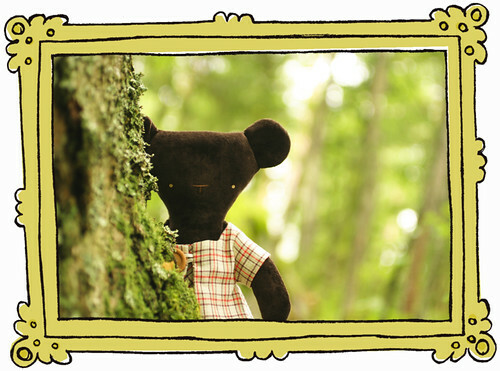 Piia likes to go picking flowers in the forest and to skip rope. She's a little shy, but once she gets to know you, you'll have a friend for life! 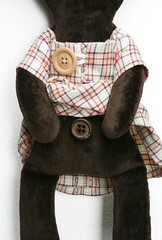 Piia is made out of soft dark chocolate coloured velvet and she's stuffed with rags and organic cotton batting. She has tiny button eyes and an embroidered nose. 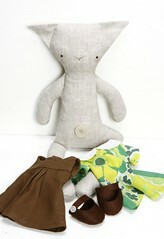 She has an old wooden button for a belly button and a round little tail filled with cotton batting. Her belly button button has a little chip on the edge, but Piia thinks it just adds to her charm. 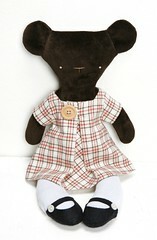 Piia is wearing a pretty plaid cotton dress, with a pleat on the front that's held closed with a wooden button. The dress closes in the back with a snap. She's also wearing a pair of crisp white tights that have an elasticated waist and a slit in the back for her tail and cute black felt mary-janes that have decorative buttons on the side. This is Maija. 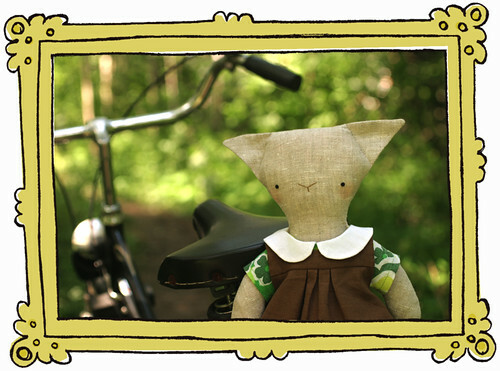 She's one of the very special rag pets going to the Plush You show in Seattle this autumn. Maija likes to read really long books and to play with dolls. She gets colds easily, but she doesn't mind because blowing her nose makes such a great trumpeting sound! 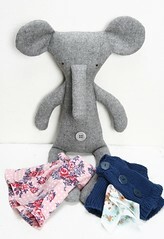 Maija is made from soft wool flannel and she's filled with rags and organic cotton batting. Her tail tassels are made from wool yarn. She has tiny little button eyes and a shiny new plastic button for a belly button. 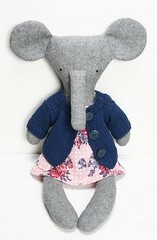 Her trunk is filled with cotton batting and she has lovely blushy cheeks. 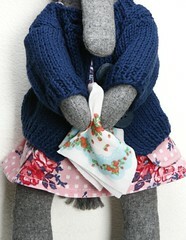 Maija is wearing a cute flowery pink cotton dress with big pockets and a warm & comfy dark blue cotton yarn cardie with old plastic buttons. The dress closes in the back with a snap. She has a little cotton hanky made from sweet Japanese fabric in her pocket. The hankie's edges have been treated with Fray Check. Maija's cardigan was knitted by the very talented Lady Illusia, and I'm very thankful for her help, as is Maija who can stay snug and warm in her cardie. 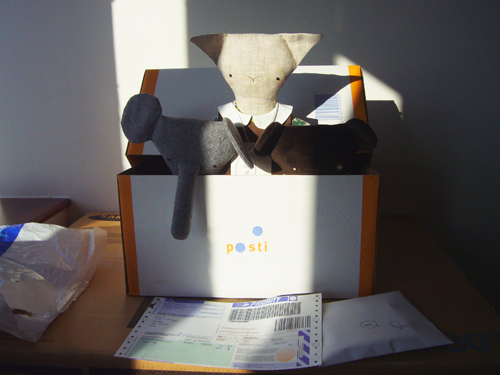 Maija, Aino and Piia set off on the latest leg of their adventure today. Packed snugly (they're maybe a little too snug in there since the box selection at the post office went from a tiny bit too small to way too giant with no size in between) into a box with some newspaper for cushioning and to read during their trip (I included the comics page), they're now on their way to Seattle. I didn't realize quite how hard it would be to let them go. Packing them up, trooping to the post office and then waiting in line to mail them was all a bit of a glum affair, despite today being a wonderful, warm and sunny day and The Night of the Arts besides. I know it's silly to get attached to your work when you know you'll be sending it off to the big world at some point, but I've spent so much time on the trio that I just couldn't help it. I keep telling myself that they're just soft toys, but I know deep down that they're much more than that, they really do have a life of their own. 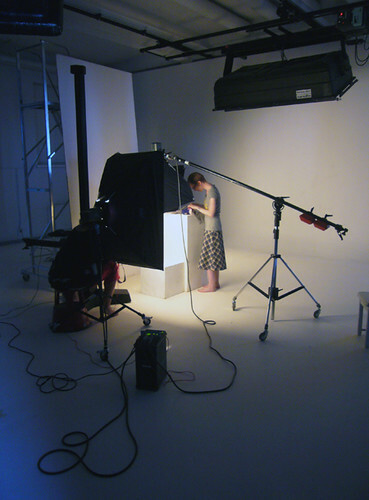 I am very excited about having my work in the exhibition, but it's still hard to let go when said work leaves the nest. I hope the Terrific Trio will have a good trip and that they'll arrive safe and sound in Seattle. Meet Aino. 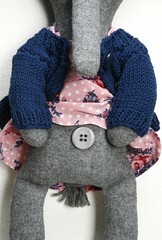 She's one of the special rag pets going to the Plush You show in Seattle this fall. Aino likes to ride on her bike and to play house. She's really good at baking, even if she does like to eat the cookie dough more than actually make anything! 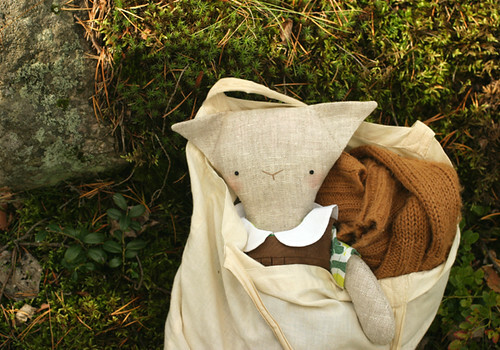 Aino is made from lovely undyed & untreated linen and she's filled with rags and organic cotton batting -her tail is stuffed with just the cotton batting. She has tiny little button eyes and a very old plastic button for a belly button. The surface of the button has crackled a bit with age, and it matches the linen's texture nicely. Her nose is embroidered and she has healthy blushy cheeks. 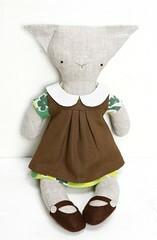 Aino is wearing a chocolate brown linen pinny, a brightly patterned green dress made from an old cotton pillowcase with a white cotton Peter Pan collar and pretty brown felt mary-jane shoes with little decorative buttons on them. 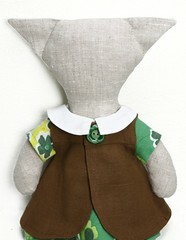 The pinny and dress both fasten with a snap on the back. The green flower button on the back of the pinafore is a vintage button I found in a sweet little vintage shop here in Helsinki. Now it's back to work as usual. I'm currently working on some business cards to send off with the Terrific Trio for people to take with them at the exhibition and I'm still slogging away at all the all the photos of them. I designed and made hang tags for the rag pets today. I already had one tag design that I had used for the very first rag pets, but I thought it'd be time for a re-design, what with Plush You coming and all. 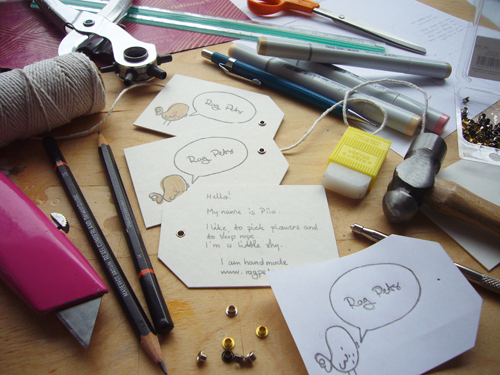 The new tags have the same talkative birdie that graces the header of this blog on the front and on the back there's the rag pet's name and a little bit about their story too. The old tags had a different bird on the front and just a "Thank you for adopting me" on the back and I thought it'd be nicer to have some information about the rag pet her- or himself there instead. I also used passer par tout card instead of Bristol board like I used to use. The card is thicker and it works well with pencil, and it has an altogether more organic feel to it, which is what I'm after with the rag pets in general too. Both me and the Terrific Trio are very honoured to have this little feature. 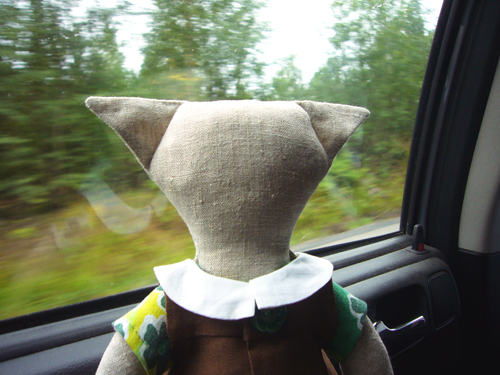 Go check out the Plush You blog, asides from all the great features of talented plushie artists, there's also information about the up coming show there. 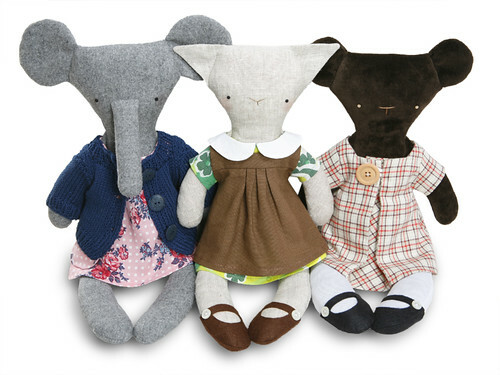 Say hello to the Terrific Trio, three very special rag pets who are going to be jetting off to Seattle very soon, to make their appearance at the Plush You show. 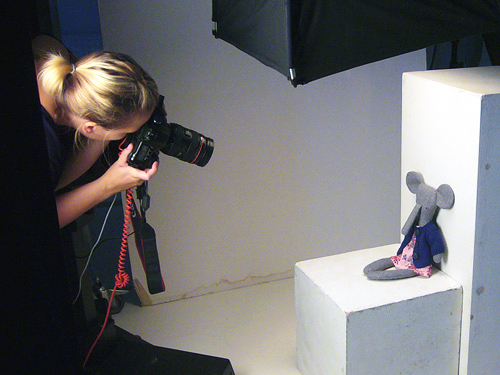 They're cute little soft toys by day, and they fight crime at night! I'll post individual photos of each and tell you their stories once I get all the photos sorted and edited. 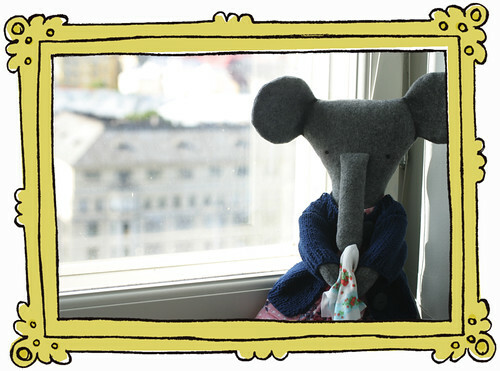 Today I took some more photos outdoors and even popped by J's office to borrow their windowsill and view for a backdrop! The weather was surprisingly nice today, even if we did have a small storm rip through here tonight. It's been dreary and rainy here most this week, and today we had a welcome patch of sunshine, so I grabbed a friend (thank you again for your help Lady A!) and trooped off to the forest to snap away. It was good I had a friend with me to hold a brolly to block the wind and to create some shade, since it really was very sunny and a bit blustery during the day. In other news, me, J, and the Terrific Trio will be taking a little trip up north to see family starting tomorrow. 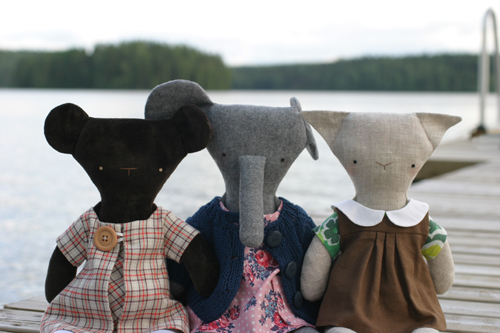 I'm hoping to take yet more pictures of Aino, Maija and Piia while enjoying the lake shore, garden and some well deserved rest. 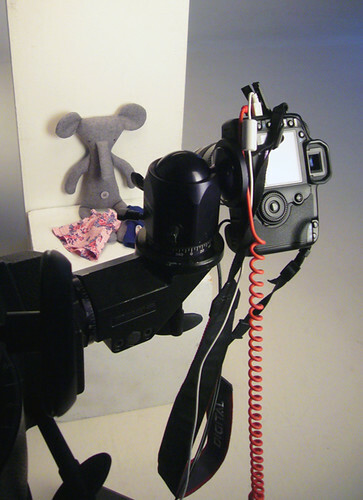 I had the wonderful chance to have the Plush You Trio professionally photographed today. J's friend is a super cool photographer (check out her work: here, she's very talented) and she lent me her talents for the day. 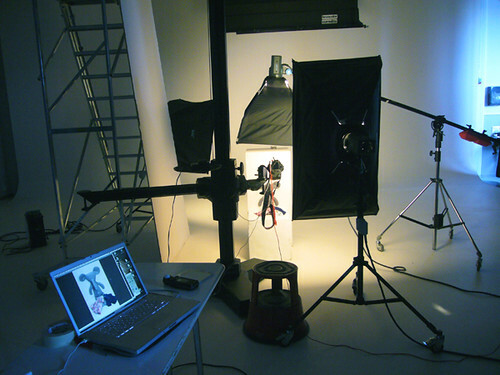 I was a little nervous going to the studio, since the closest I've been to a professional photography studio is the kind where you go to have your passport photo taken. Needless to say, I had a grand time! Not only is Jenni really nice and super talented, the studio was an experience in itself too. There were so many neat machines and things there to ogle; even the camera stand looked more like a tree! It was wonderful to see how it's really done, and I'm happy to have such high quality photos of the Terrific Trio. I finally settled on names for the trio today. I've had a handful of names floating about my head ever since I drew the first design sketches, and I've been whittling it down during this process, picking the perfect name for each one. I'm going to tackle editing the CD full of photos we got tomorrow, I'm much too tired to get stuck into it now and it's coming to midnight/my bedtime besides that. My name is Eerika and I'm addicted to fabric. My regular fabric store just moved to a bigger new location and they had a grand re-opening a few days back. I popped by the sparkly new store today and spent a mildly indecent amount of money. But I am rather proud of myself that I managed to curb my spending a little bit, seeing as with the big new shop came a big new selection of fabrics. 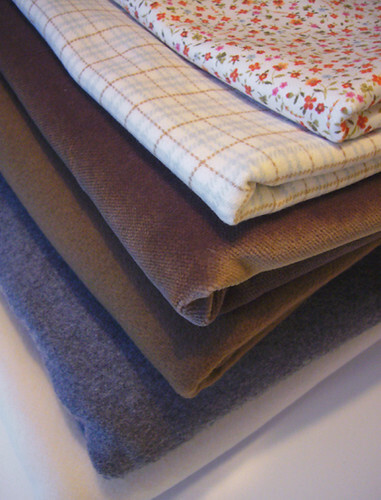 I nabbed some of lovely soft wool -since it's a seasonal fabric and I've learned to get while the getting is good-, some pretty flowery cotton, soft plaid cotton flannel and Armani (yes, I know!) velvet. I still need to go back for some really yummy nummy flocked polka dot jersey and I also want some trouser fabric for myself. And I didn't even get to the quilting cotton prints today, since I was going out to lunch with J. and he had to go hungry while I was sating my addiction. A sales girl I recognized from the old shop asked me where I went to school because I looked familiar and she thought we might have gone to the same school... and was a little embarrassed to hear that the reason I look so familiar is that I go to that shop a lot! I was a little more embarrassed by it though, seeing as my addiction has now gotten to the level that my "dealers" now know me by name. And this isn't a little mom & pop shop, but a big, huge chain store! I can't wait to get the rag pet shop up and running so I'll have money to splurge on fabric! I just bumped into Cicada Studio and Aunty Cookie on Etsy and I fell in love with the gorgeous hand printed fabrics! Then there's Kitty Craft and Umbrella Prints and of course the staggering amount of delicious vintage fabrics to be had on Etsy and eBay. Oh fabric, I wish I could quit you.